Our in-house machine shop allows us to create tooling and custom products. This means that we can create very Large Area Stencil (LAS) which require custom-made frames while the foil is being laser-cut. SolderMask's biggest stencil to date is 30.5" x 53". 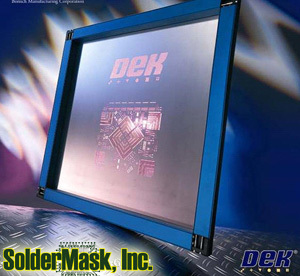 Since 1994, SolderMask, Inc. has fabricated solder paste stencil using a photo-chemical etching process. In 1998, we installed our first laser to cut the apertures of the solder paste stencil. Now, SolderMask, Inc. has 3 lasers for this work. 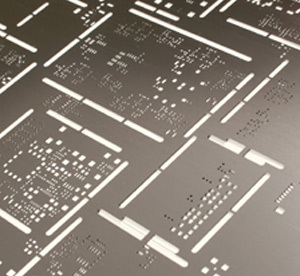 The photo-chemical etching process is still used as part of the process to fabricate step stencils. It is also used to manufacture thin metal parts. In 2005, SolderMask, Inc. installed an electropolishing process to improve the quality and smoothness of the laser cut aperture walls. This provides for a more complete release of the solder paste.